Birmingham and Baton Rouge have it. Mobile, Reno and Pensacola have it. Sulphur, Lake Charles and Natchitoches are looking at it. What is it? Bikesharing. 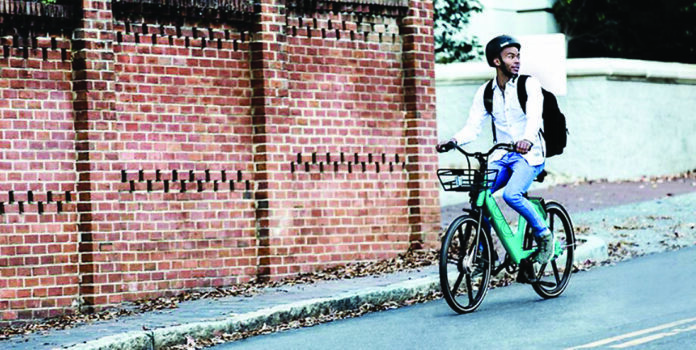 Bikesharing is self-service bicycle rentals for one way or round trip treks across cities and university campuses, large and small, that operate from an app on a smart phone or tablet. When bicycling, a centuries old activity, meshes with the modern technology of apps you’ll find where history lives. Now where have we heard that before? West said the premise is simple. Participants simply download an app, sign up, get a bike, scan the code and ride. Riders are charged a fee, much like renting a car, U-haul or a taxi. There are two types of systems; dockless and smart bikes. The dockless system utilizes bicycles that have check out and locking technology integrated into the bike. A rider locates a bike on the app, goes to the bike, scans and rides and when done simply gets off the bike and leaves it. It must be on a public location like a street, sidewalk or end of a driveway. Bikes are not to be taken into a building or garage. Each is equipped with GPS technology and are monitored. The smart bike system uses docks. This works similar to checking books out at a library. The bikes are checked out from the dock, ridden, and returned to any docking station just like a book would be checked out, read and returned to any library branch location. She said almost any existing bike rack could be made into a dock using geofencing. She also said you can place your bike on hold. For example, stopping at a restaurant for lunch or grabbing a coffee. “Smartbikes can be placed on hold while you go inside and no one can take your bike.” West said the dockless systems are the ultimate convenience at the end of the ride because it can be left practically anywhere, but the smart “dock” system is convenient at the onset because riders know where to find them. E-bikes, or electric bicycles, can be used with either system. E-bikes offer pedal assist. West assured attendees an e-bike could navigate the hills from the downtown riverbank up to Front Street with ease. “Vandalism and theft of bikeshare bicycles is extremely low,” West said. Each bike has anti-theft devices as well as each part is branded, thereby making it difficult to resell or pawn. Bantam Group is currently working on a feasibility study to see where the best locations would be for docking stations, including the NSU campus, near downtown and on both sides of Cane River. They are checking factors such as who would use the system, students, tourists or residents and where they would ride. Safety is also a factor in the study. In addition, they are evaluating the fleet size to optimize the system. “A comparable set of Cities that just recently launched bikeshare is the City of Oxford, City of Anniston, and the City of Jacksonville, Ala. They are all roughly 15,000 – 21,000 in population and Jacksonville has Jacksonville State University. It has roughly 8,000 students in enrollment. The Cities of Lake Charles, with McNeese, and several cities in St. Tammany Parish are looking into launching bikeshare,” West said. She said the program expects a lot of usage to be by Northwestern and Louisiana School for Math, Science, and the Arts (LSMSA) students. “We hope there will be a culture shift among citizens in Natchitoches and we see more usage from the community in the residential and downtown areas. We also believe bikeshare will provide greater access to large community events where parking and demand are a premium.” There were 20 attendees at the public meeting and hundreds of students during the Northwestern event on campus. Over 100 surveys were collected. Most of the feedback is leaning towards a smart bike system over a dockless system. “Thus far, the top reason provided by citizens for wanting a smart bike system is that the bicycles would be in a uniformed, contained rack when not used by a consumer and that seems to align with the historic charm of Natchitoches more than if bicycles were in a more free floating format. However, we are still exploring all options and need to gather more opinions from citizens and community leaders,” West said. Only a year or so ago, the branding initiative met to launch a new city logo and tagline. Soon after, a riverboat expressed interest in operating on Cane River. Will a bikeshare system be the next historical change for living in Natchitoches? Mayor Lee Posey fills out a survey at the bikeshare community meeting. You can help city leaders decide by participating in a survey. It is available on the Natchitoches Times website at www.natchitochestimes.com or access the survey and interactive map at https://www.natchitochesbikeshare.com/community-input.html .